With all the events that have taken place this past year and with racial tension very much alive, Ohio University students took time to remember Martin Luther King’s message and the dream that he had 52 years ago. “I look at MLK Day as a day of celebration. Dr. King is a symbol of peace, and if he were never involved in the Civil Rights Movement, it would’ve gone completely differently. MLK Day is an important day, because it symbolizes America overcoming a huge ethnic barrier,” said Kelly Bondra, a freshman studying publication design. “To me, it’s a day to recognize a man who changed the inequality between races,” said Nick Ihle, a freshman. “I think it is a testament of how America is a melting pot of many cultures,” said Bill Harman, a freshman studying mechanical engineering. “It’s a day of remembrance, and it sparks up memories of oppression for African Americans. The bad memories of the past that we regret…we need to remember that [they] happened so we don’t repeat the past and our mistakes,” said Gabe Wittmann, a sophomore studying exercise physiology. “Monday is a day to remember MLK and what he did for this country,” said Sarah Cornell, a freshman studying pre-nursing. “I feel that people don’t take it for what it is. I might be guilty of that… We don’t stop and realize why we got a day off of school. It just seems like another holiday. It’s important to remember why we are getting the day off,” said Gabby Hollowel, a sophomore studying strategic communications. “I think he’s a very important person in history. And I think we should take a day to remember any important person who made such a big impact like Martin Luther King Jr.,” said Katie Harmon a sophomore studying applied nutrition. “I think it’s great what he did and how he went about it. He was all about non-violent ways to make a difference. It takes a great person to make a speech like that and have so many people listen to you and take that initiative to make that change. I think it’s crazy how the holiday didn’t go into effect until after he was assassinated,” said Emily Vaido, a sophomore studying applied nutrition. 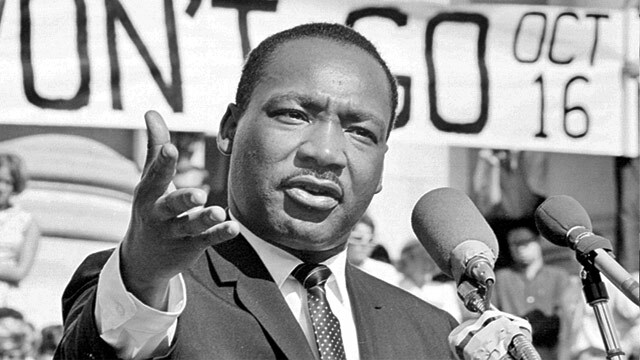 “I think it’s a time to actually acknowledge what Dr. King has done. Without him, no one would have stood up for civil rights the way he did. He was that one person who had a powerful voice. He was out there doing marches and protests in a non-violent way, and it seems like we don’t have that today. He was such a good advocator for peaceful protests. If he were around today, he wouldn’t like what he has seen lately,” said Malik Robertson, a sophomore studying media arts and studies. “It has a whole lot of significance because it is a holiday representing a man who did a lot to change this country for minorities,” said Demari Muff a sophomore studying marketing.